If you feel there is insufficient space in the yoga hall, and you increasingly want to replace the ceiling with the sky, then it is time to go outside. The absence of external limitations will expand your inner horizons and bring a wonderful feeling of newness into your practice. The fresh air will give your breath a new quality. Connecting with the earth will return you to reality and recharge your energy. The beauty of nature will soothe and inspire. Open a new world for yourself and your new self for the world! Try to find the flattest, most horizontal surface. This is especially important for balancing asanas. Of course, practicing yoga directly on the ground is the best thing to do. In this case, you can see and feel the surface’s features, and this will help you in asanas. Some studies have proven that walking barefoot is very useful. When the body is grounded, we are connected to the Earth’s electric field, and surface electrons have a positive impact on our body. For details, please follow the link. If you cannot practice without a yoga mat, do not use a very thick one. Otherwise, you may have problems with contact and balance. The best choice is to use a blanket or towel, since you will have good control and can wash it easily. You must think about keeping warm on the cold ground in order to feel comfortable, especially in lying postures. Additional warm clothes will also be very helpful for Savasana. The morning practice is very beneficial. After all, what could be more natural than Surya Namaskar at sunrise? There are also fewer people around. When the sun is hot in the afternoon, try to find a place in the shade. In any case, you can bring sunscreen and glasses in your bag. Of course, do not forget to take water. Choose your place carefully. Do not start your practice immediately, even if you like the environment very much. First, just sit down and meditate. You will understand the situation with insects and, at the same time, you will feel energy. Bring repellent just in case. 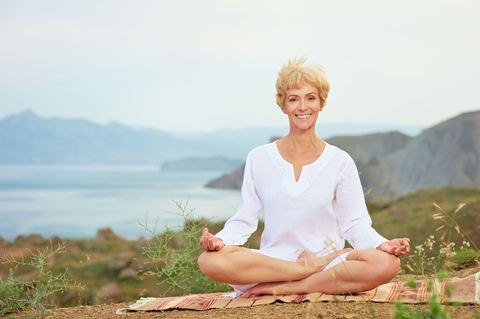 Fix your gaze on something (a flower, tree, cloud, or water surface) during asanas. Direct your senses inward, and accept the surrounding beauty of landscapes, sounds, aromas and wind into your heart. Do you remember how many asanas are named for different animals and birds? Feel yourself as part of nature, too. 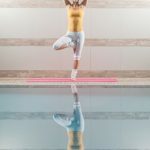 If you are already developed an increased level of sensitivity and awareness from a long-time practice, you will be strongly impressed by your experience of an outdoor practice. The main thing is not to fight against the outside world, but to merge with it. At first, you may be confused by the attention of passers-by or by somebody’s mere presence. This becomes even tougher if they start asking you questions and taking photos. Act according to the situation; simply ignore the person, ask some counter-questions, or ask them to join your practice. However, at the beginning, if you feel very uncomfortable, then it is better to find a really secluded place or to engage as part of a group. 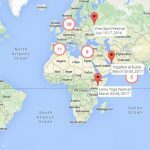 Moreover, take note of how many yoga festivals are happening all over the world. Finally, let’s talk a bit about Niyamas’ work when you move your practice outside the hall. So, you have overcome doubts and fears and taken the first step. That means that your Tapas has opened the door to the street. Sauca is the first joy you will encounter: the fresh air will give a completely different flavour to asanas. Santosa will help to cope with difficulties outside of your comfort zone. Svadhyaya is your new experience. At the very end, Isvara Pranidhana connects everything, while obtaining its own natural meaning under the open sky.